It is fun to see a whole field of growing pumpkins. I have a collection of fakes to decorate with. One year I enjoyed taking photos and playing with the images. I started a pumpkin collection that is showcased every year October through Thanksgiving. The wood or ceramic, decorative pumpkin that does not need a carving knife. Lots of smashing pumpkin color and shapes for two in a row Holiday home decor. Two months of autumn colors to enjoy. In our local town there is a teen thing that goes on that is not good for your carved pumpkin treasures. We have a steep mountain cut road that has become smashing pumpkin alley. No matter how simple your carved pumpkin is, it most likely will become crow and coyote feed along this roadway. I still have real pumpkins that stay in the house or the back yard. A white pumpkin from the grocery was very decorative and remained good till mid-March. Amazing. It was finally tossed into the compost bin. My collection is dark and primitive. All the pumpkins are from sale bins after Halloween is over. Some real gems made of glass would add sparkle and bright orange. Lately the glass versions are being shown at the discount stores such as Marshall's and Ross. The glass pumpkin is what I am going to watch for on the sale shelves. A whole table top of pumpkin shaped glass in many colors would be a bright lovely display. I started a pumpkin collection for display every year. Yes, the wood or ceramic, decorative pumpkin that does not need a carving knife. The colors are earthy and a collection can be put out before Halloween and left in place till Thanksgiving. Lots of smashing pumpkin color and shapes for Holiday home decor. In our local town there is a teen thing that goes on that is not good for your carved pumpkin treasures. We have a steep mountain cut road that has become smashing pumpkin alley. No matter how simple your carved pumpkin is, it most likely will become crow or coyote food along this roadway. I still have real pumpkins that stay in the house or the back yard. A white pumpkin from the grocery was very decorative and remained good till mid-March. Amazing. It was finally tossed into the compost bin. What kind of pumpkins do you like? I have both, because pumpkins are all about fall and autumn. I do not have glass pumpkins, but wouldn't they make a bright and cheery display? A tall narrow curio display cabinet that has a light on top that dazzles of such a display is tempting. There are many examples of glass pumpkin. Select 'Home and Kitchen' and search for glass pumpkin at Amazon.com when fall shopping comes around again. I am going to search the discount stores and start a front window display the year.The afternoon sun will bring the sparkle out every afternoon till Thanksgiving. I think it will be worth having for many years to come. You may even see some photos soon. Hand blown art glass orange pumpkin with soft striping tops off your fall decor with elegance.Due to the handmade nature of this item, stem may be green, dark green or black. Are You Decorating For Fall? paperfacets, Thank you for the product line. 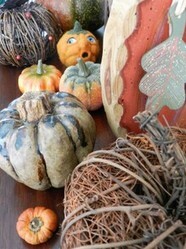 Ceramic, glass and wood pumpkins are lovely displays for October and November celebrations. Have you found your perfect glass pumpkin? Have any of the teenagers explained why they like to smash other people's pumpkin displays? Yes, and I love your collection! So perfect for this time of year. We can usually keep real pumpkins around, but it's so much more practical to have glass and ceramic ones that can be used year after year. That way, we can enjoy our favorites over and over again. Your Fall pumpkin fare makes a delightful display. A shame about the teen trouble with pumpkins! I see a few pumpkins and gourds smashed on the streets when walking my dog. I am not impressed!